The discerning enthusiasts’ publication with in-depth and honest reviews, the best layout photography and detailing articles and all the latest news from the trade. Our improved subscription service is just the ticket. Sign up today and you never need miss an issue again. RAIL EXPRESS will be delivered to your door – post free! You’ll also get access to great value preferential renewal rates. SAVE OVER 12.80 with a two year subscription. 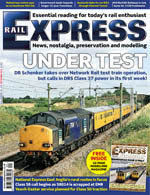 24 ISSUES for the price of JUST 21 – 12 ISSUES for the price of JUST 11 – or try RAIL EXPRESS today with a SHORT TERM SIX MONTH SUBSCRIPTION. Visit our secure, easy to use subscription website – Classic Magazines today! You can now also order our smart binders on-line. Click HERE to view them. Buy just the current issue – secure on-line!